Looking for the perfect wedding gift can be extremely difficult especially if you know they have everything already! Therefore we have produced this guide to help you with your wedding present dilemma. Stemless wine glasses make excellent wedding favours and with a wide selection of choice you can be sure to make both the groom and bride happy. They are also ideal for giving as a present for anniversaries and other celebrations. You want your wedding gift to not only be appreciated by the happy couple but to last. You can feel assured when buying stemless wine glasses that they are a worthwhile investment. Stemless wine glasses can be used for wine and a variety of other drinks including whisky, spirits, cocktails, water and soft drinks. A functional glass indeed! Stemless wine glasses are available in a variety of designs. You can choose from heavy, sturdy stemless wine glasses to lighter designs with a smaller bowl. You can make your gift truly stand out. Most stemless wine glasses come packaged in attractive gift boxes and you can also add stylish wrapping to your gift to make it extra special. The wrapping paper can match the bride and grooms wedding colours making your present extremely thoughtful. You could even buy personalised ribbon to wrap around the gift box with the couple’s names and wedding date on it. If you really want to give a unique present you can have engraving on your stemless wine glasses. This is available from some companies and if not, you can send your glassware to professional engravers. 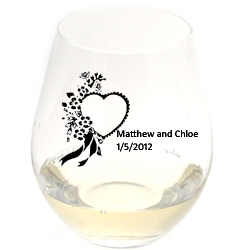 We are pleased to currently offer personalised stemless wine glasses and glassware engraving (minimum order 250 glasses). So if you have an order you would like to place with us call us on 01903 786148 to discuss or fill in our online form. Stemless wine glasses can be used to ‘toast’ a special day. They offer an alternative to the traditional wedding gifts such as champagne flutes or whisky glasses. We offer a fantastic range of stemless wine glasses, which are ideal for giving as a gift or present for special occasions. If you do need any assistance with your stemless wine glass purchase or further information then please contact us. We are always happy to help.